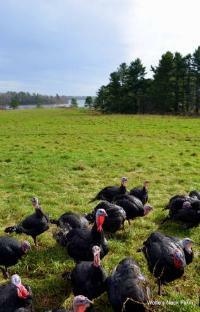 Looking for a plump, healthy, free-range turkey for Thanksgiving or Christmas? In addition to turkeys they also offer a wide variety of organic greens and vegetables. Also have natural range fed beef, pork, poultry and lamb, eggs, maple syrup and more. They can ship a gift basket anywhere in the world. and fiber goats as well. goats milk, vegetables, herbs and flowers. nonprofit farm is open free to the public every day from dawn to dusk. venison meat, Ostrich, Free-range chicken, turkeys and other all natural meats. Raises and sells over 600 free range turkeys per year. Also sells chickens. overcrowding. Farm also has educational programs for kids and families. Narragansett turkeys (a heritage breed turkey) poults and their fertilized eggs. turkeys, also raise rare French, British and American breeds of sheep and cattle.